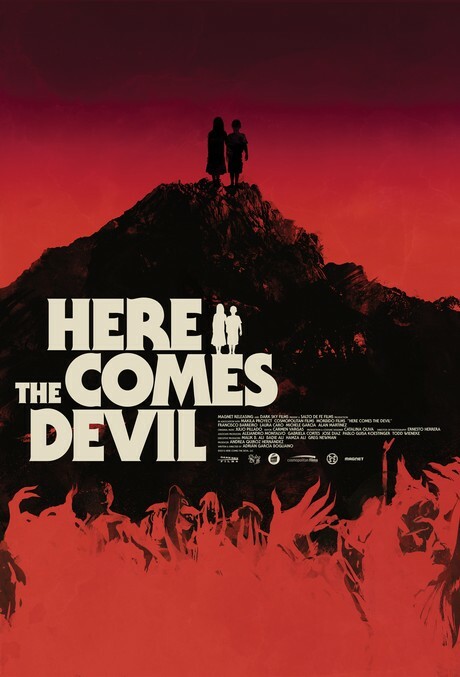 Check out this really cool Mondo-esque poster for the creepy kid thriller HERE COMES THE DEVIL! Ahoy, squirts! Quint here with a nifty debut for you guys today. I've been hearing good things from HERE COMES THE DEVIL from the festival circuit. It's a horror flick about two lost kids who return to their parents, but are these really their kids? Something is different about them. Right up my alley! So, we have the poster to debut for you today and it's pretty killer. Looks like it took a cue from the Mondo craze and made a striking red and black image that convey a definite tone better than any floating heads or line-up style photo poster. Magnet is distributing both theatrically and VOD on December 13th.